Uh, we have some bad news for you. All the pets of America got together and held a meeting and decided that all fireworks should be cancelled today. Not only are they dangerous and a fire hazard, but. more importantly, they also go KABOOM and the pets lose their minds. And they don’t want to lose their minds anymore, so they’re putting down their paws in protest. So. No fireworks. We all agree. It’ll be hard to break tradition and sad to not see the display light up the sky, but there are other, better ways to celebrate the Fourth of July. Here’s what we recommend doing. Wear star-spangled gear—Nothing screams AMERICA like some flag shorts or a red, white, and blue bandana. Go swimming—Lake, ocean, pool, hot springs, hot tub, bath tub, sprinkler. It doesn’t matter. Swimming is American. Eat apple pie—And baked beans and potato salad and hamburgers and hot dogs and chocolate chip cookies and barbecue. Make a flag cake—You know, the one with the blueberries and strawberries and whipped cream that’s all over Pinterest. Sing patriotic songs—Challenge your party guests to see who knows the extra verses of America the Beautiful and The Star-Spangled Banner. Watch Independence Day—Scary movies don’t scare pets nearly as much as fireworks do. Unless humans squeeze them too hard when we get scared. Light candles—It’s America’s birthday, after all. And you have that newly-decorated flag cake to put the candles in. Light sparklers—They’re still like fireworks, only they’re safer and don’t come with the loud sounds. Watch fireworks on TV—Hate to break it to you, but no fireworks you see IRL will be even remotely as good as the ones you can see on TV. 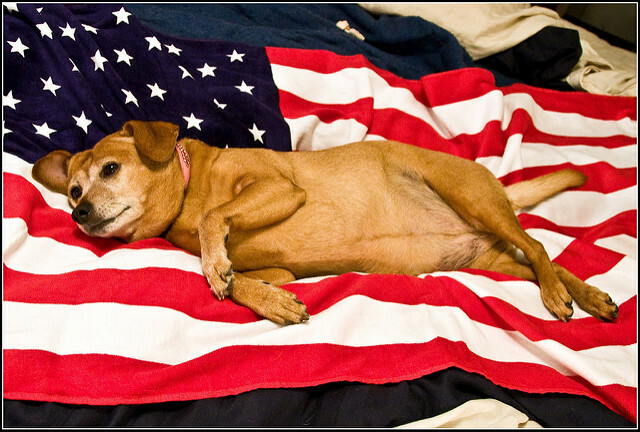 Whatever you choose to do that doesn’t involve fireworks, remember that your pets, your faithful friends who love you unconditionally, will thank you. And if you still light fireworks, they will retaliate. Hard. And eat your couch and your windowsills and doors. They will still love you, but they will be mad.